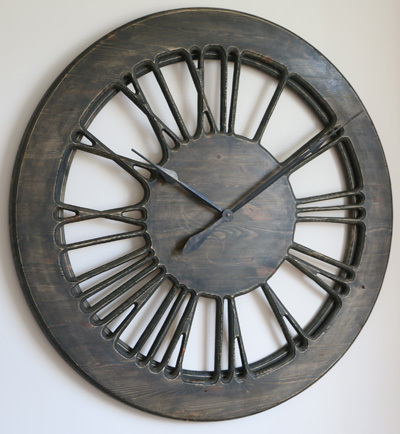 Rustic Large Skeleton Clock. Beautiful handmade functional wall art. 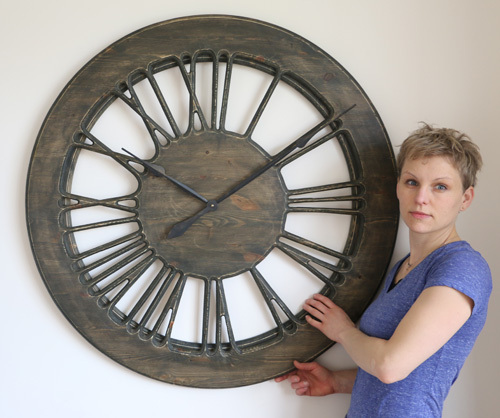 The “Light Rustic” Skeleton Wall Clock is handmade from a single large panel of pine wood with additional circular rim at the back. It is a member of the new family of hollow clocks. The clock face is displaying Large Roman Numerals and the wall colour is visible in the background. With a total diameter of 100 cm and its classic design, the “Light Rustic” will look fantastic in all interiors. 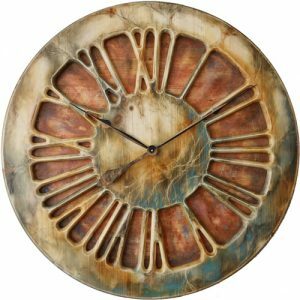 This delightful rustic skeleton clock is beautifully designed and hand crafted to be a centrepiece in your living room. It displays large wooden roman numerals and you can see the wall between them. You may have come across Peak Art website because you were looking for unique wall decoration. Perhaps somebody told you about our one of its kind skeleton clocks? This captivating piece of art is handmade from a single large panel of pine wood. It gives so much unique character and light feel. 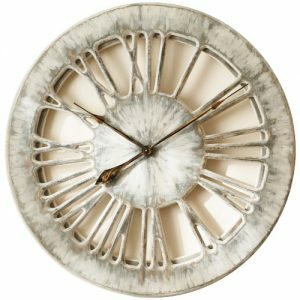 It has a narrow circular rim attached at the back which provides more three dimensional look and helps in hiding the clock mechanism. The “Light Rustic” is one of more affordable timepieces in our collection but by no means cheap. The mechanism is the most powerful Quartz sweep movement powered up by a single C Cell battery. The clock is delivered with both hands detached to prevent any transport damage. You can watch this short video where I demonstrate attaching the clock hands as well as setting the time. 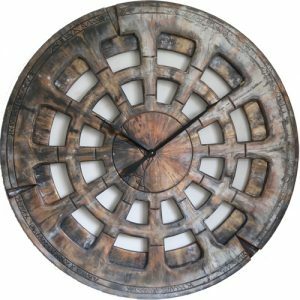 At Peak Art we only provide the best quality remarkable statement clocks that would provide strong “wow” factor to everyone coming across them. All our products are luxurious and expensive pieces of art. They will come to your mind when you start redecorating your house or trying to fill empty wall space. 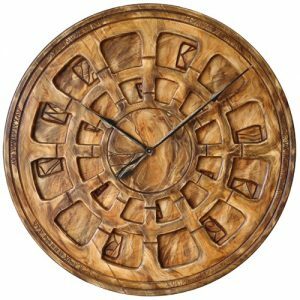 The clocks have distinct handmade finish and traditional round shape. You can mount them in any room at your home but be careful and don’t place them close to direct heat or moisture sources. 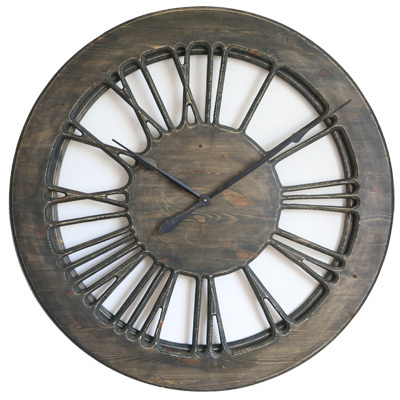 Any large skeleton clock from Peak Art can also be placed in big halls, entryways, office or hotel reception. 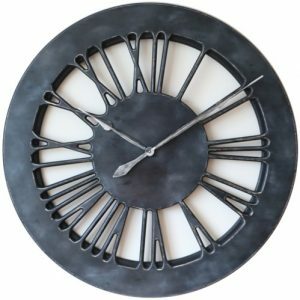 Don’t follow the old fashion, challenge the accepted trends and make our oversized handmade wall clocks the new interior design direction. Only at Peak Art you can find the true uniqueness in this niche and you can stand out from the crowd by owning something so superior.